The problem of the measure of authenticity that is to be attributed to the various recensions of the Kabir-vanis, the "Sayings" of Kabir, is a particularly vexing one. Scholars agree that Kabir, probably horn towards the middle of the fifteenth century in Benares as a lowly "julaha", i.e a Muslim weaver, must have been illiterate - or at most half-literate - and that it is very unlikely that he himself ever wrote down any of his own verses and even more unlikely that he composed any literary work. His famous utterances, couched in a form of old "Hindui", which at the time was not yet a literary language, must therefore have been transmitted orally for at least two centuries before they were first written down.' This oral mode of transmission naturally left the door wide open to all kinds of alterations, interpolations and additions, so that the number of verses. 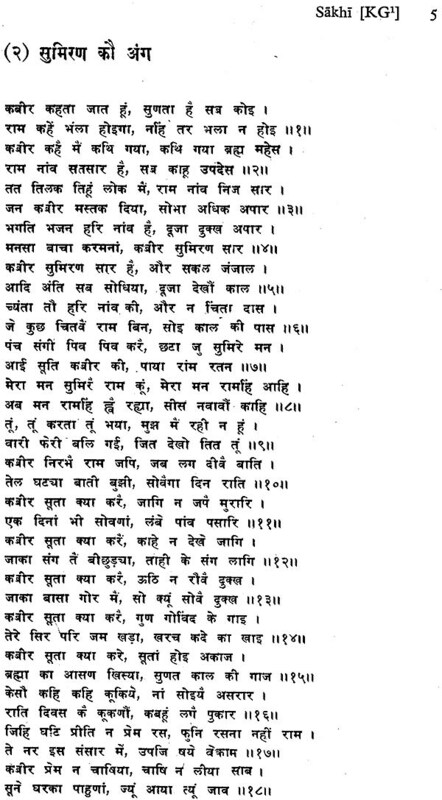 Now-a-days attributed to Kabir in northern and central India runs well into the thousands. 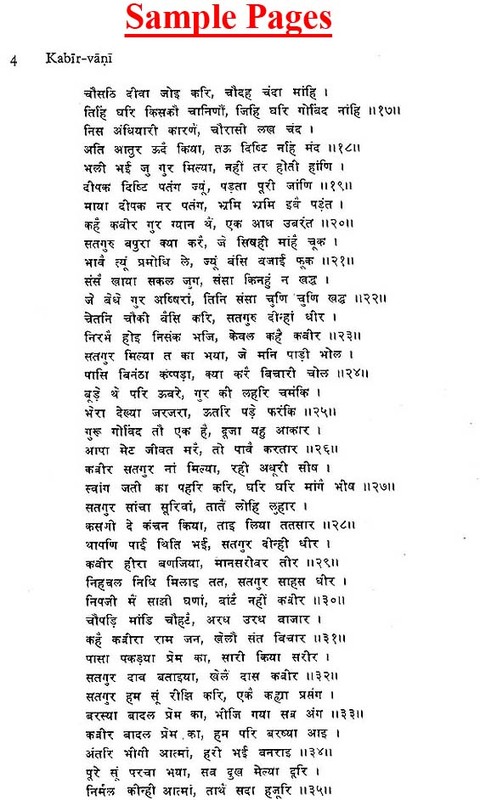 Besides those numberless oral or written additions to the cherished treasure of Kabir's sayings, a number of composed works have been found attributed to him," especially by the sectarian Kabir-panthis, a later sect which claims to have been founded by Kabir himself, their now divinized Guru. The most famous of such compilations is the Khas Granth, whose manuscript is preserved in the "Kabir Chaura" math at Benares itself, the main center of the Kabir-panthi sect. 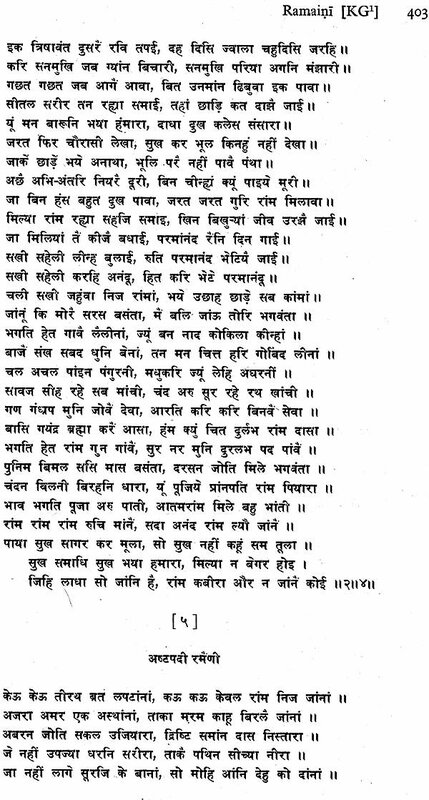 The Khas Granth is a large compilation including no less than twenty works attributed to Kabir. 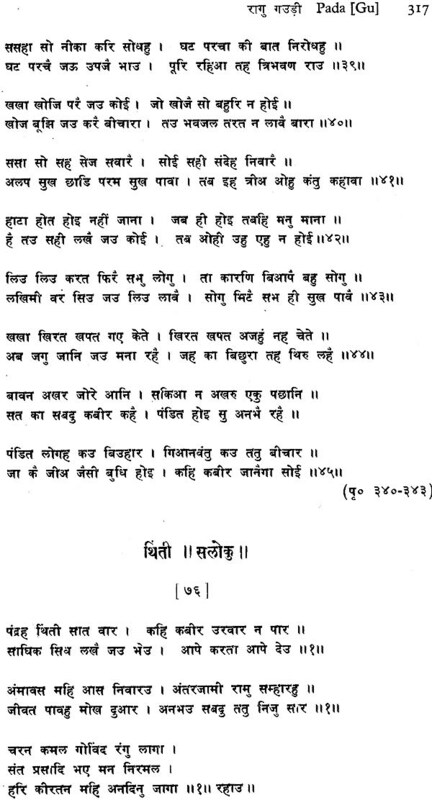 The last book in that compilation and by far the most revered by all Kabir-panthis is a collection of Kabir's verses called the Bijak, literally "the Seed", or "Chart" [of secret treasures]. Several other manuscripts of that famed compilation are still in the possession of the Kabir Chaura math and of some others maths belonging to other sections of the same sect elsewhere" - but the mahants of those maths are so far reluctant to have them published. 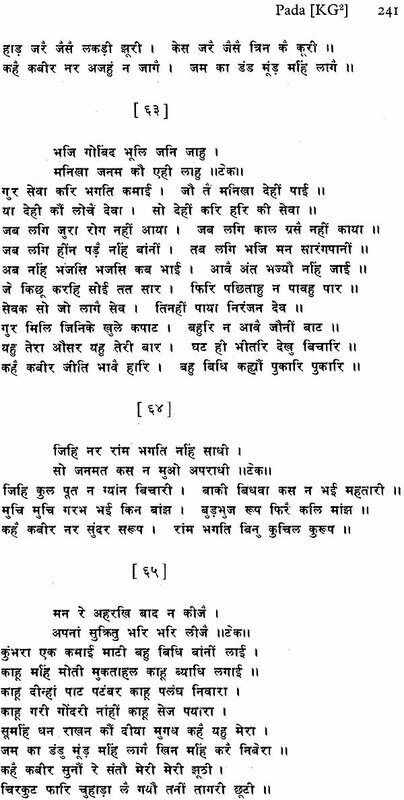 The copy of the Bijak in daily use (and daily worship) in the Kabir Chaura math appears to be an old lithographed copy of one of those manuscripts. Representing the "authentic" Kabirpanthi tradition of Kabir's verses as prevalent in Eastern Uttar Pradesh and in Central India at least from the seventeenth century onwards, the Bijak may be taken as representative of the "Eastern" recension of the Kabir-odms, as opposed to other fairly ancient recessions of the same current in Western India. Kabir himself being an Easterner, some scholars have argued - with the Kabir-panthis themselves - that it is the Bijak who should be accepted as the most authoritative collection of the famous saint's utterances. The Bijak itself has come down to us mainly m two forms, a longer and a shorter one. 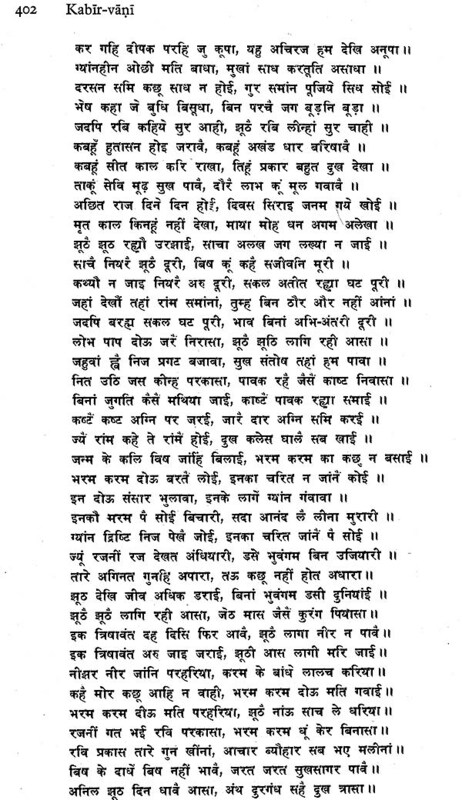 Yet, even in its shorter form, the Bijak text cannot be accepted as totally genuine, as shown by Parashuram Chaturvedi and other Kabirian scholars+ not only does this compilation include a number of meaningless and obviously corrupt verses, but it also contains numerous references to the elaborate cosmogony and religious beliefs peculiar to the sectarian Kabir-panthis themselves. The Bijak has not been critically edited yet, though a beginning in that direction was made in 1972 by an Indian scholar." 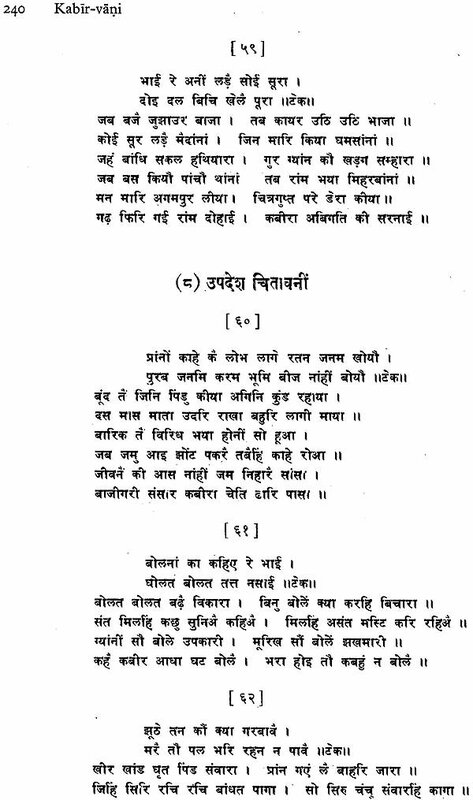 The standard edition of the Bijak presently in use is that of Hansdas Shastri and Mahabir Shastri, first published in 1950 A.D. in Barabanki (U.P.) and usually referred to as "the Barabanki edition. The collection of satirical verses and paradoxical utterances (ultabamsi) in the Bijak are particularly striking and they match rather well, in spirit and in style, with similar verses found in the other recessions. 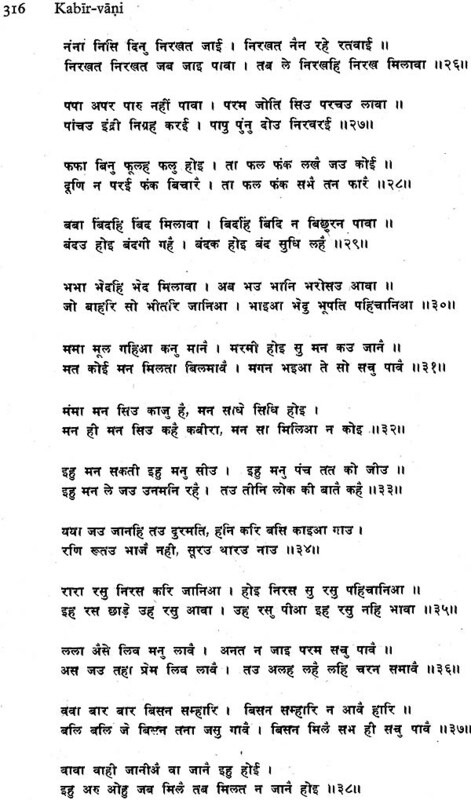 Yet it is a fact that, as a whole, the Bijak includes a relatively small number of verses (or parts of poems) common with the two other main recessions of Kabir's verses compiled in Northwestern India." The Bijak therefore ought to be studied as a separate tradition which we call the "Eastern" tradition. As the major authoritative collection of Kabir's verses current in the practice of the Kabir-panthi sect, the Bijak early attracted the attention of Western missionaries and scholars, also of some westernized Indian Christian scholars, from the end of the nineteenth century onward. 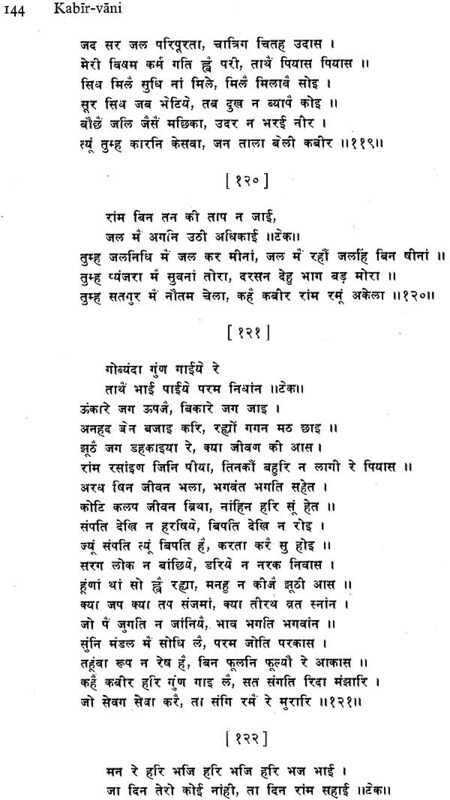 As a result, a first attempt was made by the Reverend Prem Chand, as early as 1890 A.D., at editing the Bijak and at translating that edition into English. Another English translation by the Reverend Ahmed Shah appeared in 1917 A.D.s None of the two translators was very successful to the point that the result of their labours is hardly understandable to the Western reader today. Yet these early attempts at translating Kabir's purported sayings were a witness to the newly-awakened interest for the Sayings of Kabir among the first generations of Christian missionaries in India. 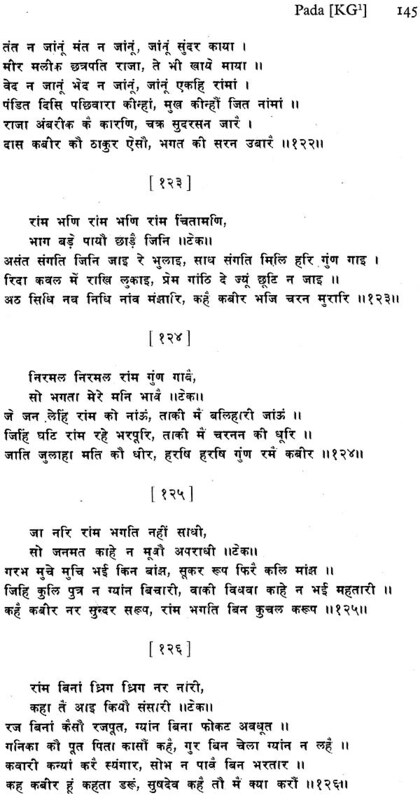 The two other most ancient and important compilations of Kabir's verses originated in Northwestern India, in Panjab and Rajasthan respectively: it is apparently in those areas that the teachings of Kabir made the greatest impact on the Hindu and Muslim masses and that they were most enthusiastically received, assimilated and later written down. 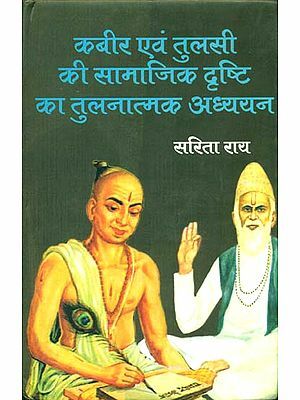 Several religious sects were founded in those regions from the sixteenth century onwards which directly or indirectly depend on Kabir's teachings: such were the Dadu-panthi and the Niranjani sects in Rajasthan and the Sikh Panth in Panjab. The latter, founded by Guru Nanak in the early sixteenth century, later evolved into a religion distinct from Hinduism.